The Met Office is warning residents to expect strong winds this evening (Wednesday). 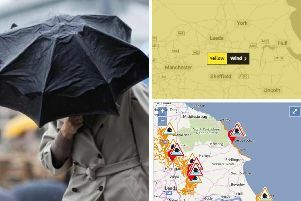 A yellow “be aware” warning has been issued for Yorkshire and the Humber, and is valid from 5pm today to 6am tomorrow (Thursday). The spokesperson said the public should be aware of the risk of disruption to transport and possibly power supplies.